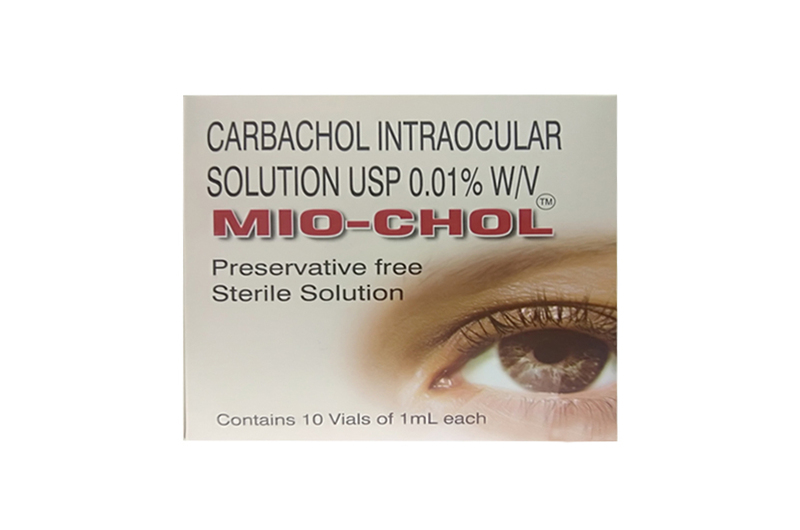 MIO-CHOL Sterile Solution(Carbachol Intraocular Solution ) is a sterilized solution of carbachol in an aqueous vehicle that is physiologic with ocular fluid, used to induce MIOSIS during intraocular surgery. Primary packing - 1.0 ml solution packed in a 2 ml glass vial, with rubber stopper and flip-Off seal. Secondary Packing - Labels, pouch, multi Cartons, & Shipper box. Store between 15 ?C to 25 ?C, Store away from sunlight. 1.0 ml of solution in 2 ml glass vial with rubber stopper and flip off seal. MIO-CHOL (Carbachol Intraocular Solution USP) is a potent cholinergic (parasympathomimetic) agent which produces constriction of the iris and ciliary body resulting in reduction in intraocular pressure. The exact mechanism by which carbachol lowers intraocular pressure is not precisely known. Intraocular use for obtaining miosis during surgery. In addition, MIO-CHOL (Carbachol Intraocular Solution USP) reduces the intensity of intraocular pressure elevation in the first 24 hours after cataract surgery. Do not use if package is damaged. Do not resterilized, Resterilization on this product has not been validated. Discard remaining solution after single use. Physical, chemical and microbiological parameters may not be guaranteed if MIO-CHOL (Carbachol Intraocular Solution USP) is reused. Avoid excess fill to frontal eye chamber allergic reaction may occur in hypersensitive patients. For Intraocular use only. Preservative free. Not for injection. Protect from freezing. Keep out of the reach of children. MIO-CHOL (Carbachol Intraocular Solution USP) is packaged in a 2.0 mL glass vial in sterile pouch. Aseptically remove the sterile vial from the pouch package by peeling the backing paper and dropping the vial onto a sterile tray. Withdraw the contents into a dry sterile syringe, and replace the needle with an atraumatic cannula prior to intraocular instillation. No more than one-half milliliter should be gently instilled into the anterior chamber for the production of satisfactory miosis. It may be instilled before or after securing sutures. Miosis is usually maximal within two to five minutes after application. MIO-CHOL (Carbachol Intraocular Solution USP) is preservative free, sterile solution, non  pyrogenic, 1 ml preparation supplied in a glass vial packed in a sterilized pouch, such 10 pouch packed in outer carton and such 28 outer cartons packed in a shipper.